Senator Joe Liberman gives aide and comfort to the enemy which is a war crime. The health insurance industry is at war with the sick. They want them gone from their insurance coverage. The sick are the enemy. Joe Liberman is supporting those parasites, the health insurance industry, that victimize the helpless. When people need their coverage the most, when they are most vulnerable, is when the insurance company strikes. Liberman is guilty of aiding and abetting the victimization of the American people. Senator Liberman comes out on the side of the MONEY, the insurance companies, AEtna, Cigna, The Hartford to name a few. Hey, it's easy, the insurance industry have been pouring millions into the campaigns of the Republicans and Liberman is a closet Republican and has benefited from their largess. Guess he didn't get the quote, " “If you can't drink a lobbyist's whiskey, take his money, sleep with his women and still vote against him in the morning, you don't belong in politics”, therefore Lieberman should hang it up. Three greatest lies are; the check is in the mail, I gave at the office and Fox (make it up) News is fair and balanced. Evangelicals the crazies in America - Republicans cater to the crazies. "...buffoons like Rush Limbaugh and Glen Beck and other people who are not terribly bright themselves and talking to even stupider people" Frank Schaeffer. 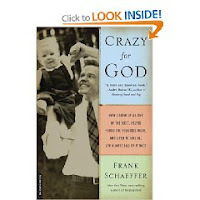 Frank Schaeffer "Crazy for God"
"Crazy for God: How I Grew Up as One of the Elect, Helped Found the Religious Right, and Lived to Take All (or Almost All) of It Back:"